How does it work? Splash Math has an app for 1st grade to 5th grade, a total of 5 apps (hopefully, sixth grade is coming). It approaches math in chapters with easy, medium, and hard levels. Spash Math is customizable – you can focus on one chapter or let the concepts come in a few questions per chapter at a time (which is how I prefer it, and my kids prefer it too because it keeps it a little interesting). 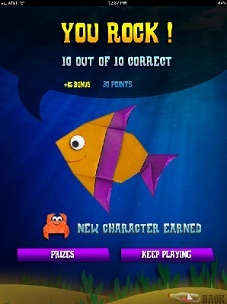 On 1st grade to 3rd grade, you earn little sea animals when you answer so many questions correctly. The animals bounce around and you can feed them, make them bounce around, etc. Something gets lost in translation in that last sentence; it really is pretty cool and the kids love it. On the 4th and 5th grade Splash Math apps, you lose the dancing sea folk and get something I really love: a graph that charts the progress from the beginning of the grade to the end. I can’t say enough about this – it is just really cool and gives you a clean look at the progression. This is also a good app for realizing the true promise of the iPad. It keeps an on-going record of your child’s progress and sends you an email each week explaining what your child has done well and where your child still has weaknesses. For some reason, I bought this app and just left it on the proverbial shelf for almost a year. I’m not sure why, but I just didn’t like it our first time around. When we rediscovered it, I just fell in love with it. I’m pretty sure there is still a lite version of Splash Math. If there is, don’t take my word for it. Download the lite version and see for yourself if it works for you.